Siamese cat names – what’s good, what’s bad, and what’s right for you? Whatever it is, most people – even those who aren’t cat people – are familiar with Siamese cats. If you’re thinking about getting this type of breed, you’re in luck – we just created a list of awesome Siamese cat names. This unique, beautiful cat deserves a fabulous name. Here area some ideas! DC – from That Darn Cat, another Disney film featuring a Siamese cat! With their exotic looks, storied history and regal personality, Siamese cats are a great breed for mythical cat names. As mentioned above, Siamese cats have quite recognizable physical characteristics. This includes a slim, sleek build with short fur, elongated ears and striking blue eyes. Siamese cats are also known as a chatty breed, frequently making a loud, low-pitched sound to demand attention. The cats eventually appeared in Great Britain and then the United States near the end of the 19th century, and the rest is history. If these names aren’t fitting your fancy, try out online generator and sort by your personal style and interests. And if you have other ideas for Siamese cat names, we want to hear ‘em! Post your ideas below. I found some Japanese words that would be ideal to name a Siamese cat. How about “Tatsukami.” That’s the Japanese word for “tornado” Maybe a Siamese black cat could be named that. Also, “Yuki Dama” is Japanese for “snowball.” Maybe you could be a little ironic and name a black Siamese cat Yuki Dama. Funny, huh? My beautiful little Siamese girls name is Clawdia !! Just got a siamese mix .. looks chocolate point with long hair. Thinking of the name Chai. Don’t have my kitten yet (August), I’m thinking Loki. Does any one like a name for a Siamese cat Daisy flower. My fur babes are named Salem and Prince(after the late singer plus his attitude fits even though hes a love bug.) so those may be options. Annie, from the King and I. Jade, koi, Tancho, Shade. Just some ideas. favorite drink, but do not let me fool you….really stood for Kesslers Diamond & Jewelry. Ours was “Houdini” every time the vacuum went on,,,,, he disappeared! My boy was Riley and even though not a Siamese name, he was the best Siamese cat ever! RIP Riley! 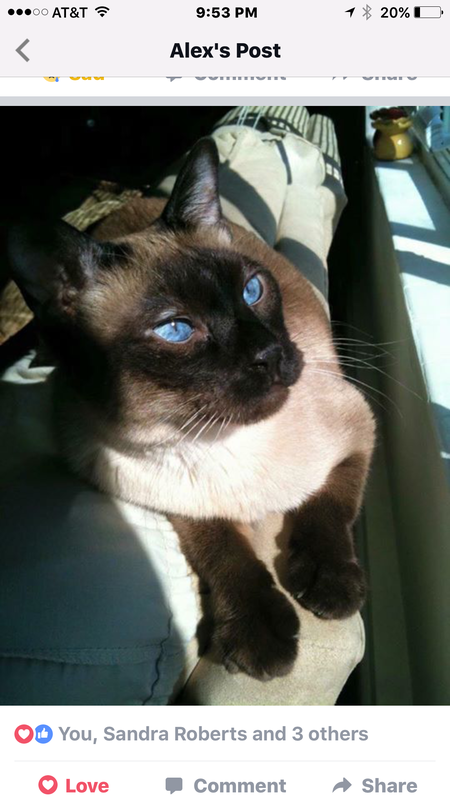 My Siamese (chocolate/seal point) I had as a young adult was Cinnamon. Her mom was Ming, I don’t remember the dad’s name. My Siamese boys were purchased at the same time although not from the same litter. Ones name is Thackeray Binx from the movie Hocus Pocus. We named our 16 year old Siamese cat T-Mac. “T” for short. He got that name from a Orlando Basketball player, Tracey McGrady who was our favorite Orlando Magic basketball player back when he adopted us He is demanding, selfish, patient, but fluffy and extremely adorable. Not sure if he is anything like the person he is named after, but I hope he sticks around for a long time. My Siamese cats were Piewacket from Bell, Book & Candle and Spice for her coloring. Mine are Tiger, Chester, Molly & Daisy . My Siamese Seal Point is named Bamboo! For my two Siamese kitties I’m thinking of Lily and Jasmine, still deciding though. Im looking names for my fawn pt baby boy, so far ive got Shiloh ,Loki , Louie , Bodie ,Kai , anyone ???? please . My Siamese are Xena, Ailis and Morag. Purdey, Dusty, Cocila, Ming Miaau, St Claws, Tiger, Kublai Khan and Sparkles. I named my male siamese Alicon after a siamese we had as a child. I don’t know where my mom came up with that name but I thought it was a good name for my siamese I have now. My mom’s Siamese cat was named Suki. Can’t say how much I miss them!! Growing up I always had siamese. Smokey, Princess, Tomasina, Hashimoto, Ling Ling, May Ling, Ching Lao, and our big boy we just lost, Remington or we called him Remi. I’m thinking our new boy will be Smokey. My Blue Point female is named Lady Luna.